Friends..Here are the Important Current Affairs Updates for 11 July 2015. This will be useful for all upcoming exams. 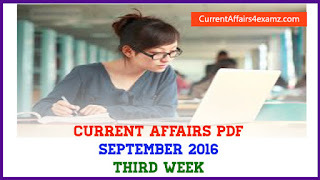 Hope you are following our Daily Current Affairs Quiz 2015 also daily. --> World Population Day was observed on 11 July 2015 with theme Vulnerable Populations in Emergencies. --> The theme focuses on the record number of people displaced by crises – some 60 million according to the latest UN figures. --> The event was established by the Governing Council of the United Nations Development Programme (UNDP) in 1989. --> South Africa debutant Kagiso Rabada on 10 July 2015 became only the second cricketer in the history of One Day International (ODI) cricket to claim a hat-trick on ODI debut. --> Rabada, 20, became only the second player in history to claim a hat-trick on ODI debut, joining Taijul Islam, the Bangladesh left-arm spinner, who had achieved the feat against Zimbabwe in December 2014. --> Serena Williams (USA) won 2015 Women’s Singles Wimbledon title. --> In the final match played at London she defeated Garbine Muguruza of Spain by 6-4, 6-4 score. --> It is her sixth Women’s Singles Wimbledon title and overall 21th Grand Slam title. --> The powerful Typhoon Linfa has hit the southern China after it made landfall on southern province of Guangdong. --> Typhoon Linfa has hit the southern province by bringing winds of up to 126 km/hr along with heavy rain. --> However after it had made landfall, the typhoon has lost strength rapidly after it passed near Hong Kong due to weakened low pressure area. --> Egyptian-born actor Omar Sharif, best known for his part in David Lean's ‘Lawrence of Arabia’ and the lead role in ‘Doctor Zhivago’, died of cardiac arrest on 11 July 2015. --> Sharif started his career in Egyptian films in 1953 with "Sira Fi al-Wadi" ("The Blazing Sun") opposite Faten Hamama, whom he later married. --> He worked in over 20 films before being approached for the role of Sharif Ali in "Lawrence of Arabia" (1962) which was his first Hollywood movie. --> Stuart Broad and Moeen Ali led England's charge to a 169-run victory over Australia with a day to spare in the first test on 11 July 2015 to make a flying start in their bid to regain the Ashes. --> England will head to Lord's for the second test knowing that of the last 17 Ashes series, the team that has eventually won first test has won the opening test 15 times. 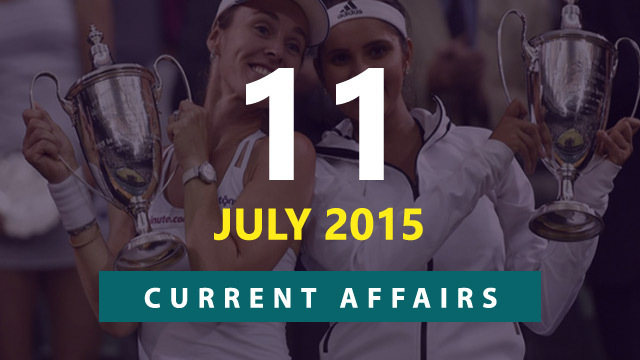 --> Sania Mirza and her partner Martina Hingis produced a stirring fightback to claim the Wimbledon women's doubles title 2015. --> This is Sania Mirza's first-ever women's doubles Grand Slam title. --> Sania's partner Hingis held her serve to seal a 5-7 7-6(4) 7-5 win over Russians Ekaterina Makarova and Elena Vesnina. --> For Sania Mirza, it was a maiden women's doubles title at a Grand Slam although she has won three mixed doubles titles at the majors. --> She won Australian Open (2009) and French Open (2012) with compatriot Mahesh Bhupathi and the US Open with Bruno Soares last year.